Welcome to our summer getaway! Our cottage offers breathtaking views of the St. Lawrence River and the North Shore. We are 20 minutes from all the offerings of Quebec City and even closer to Levis and Ste-Foy. Completely renovated in 2011, we have been careful to keep the quaintness of the place. 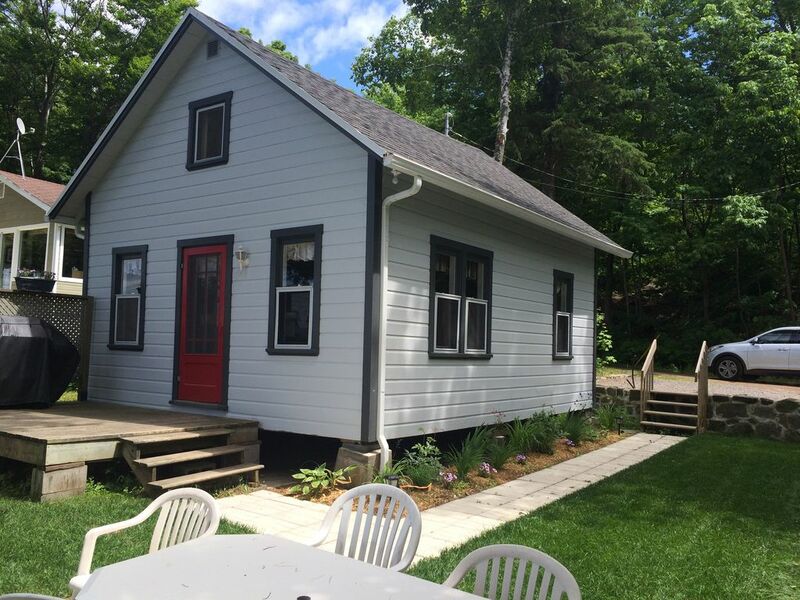 The two bedroom cottage can accommodate 4 people and is perfect for a single family. It is fully furnished with dishes, bedding, a fondue pot, washer / dryer, outdoor BBQ, patio set, fireplace (wood provided), etc. We also have a flat screen TV and wireless and baby equipment can be provided if required. You will find all necessary services nearby- grocery stores, butchers, fromagerie, public market, restaurants, theater, golf course, bike path, etc. We live in Monteal and rent when we cannot be there. We are sure you will love the peacefulness as much as we do! Hi! We're a family of three who live in Montreal. Mario is from Quebec City so we visit there as much as possible. I am originally from Newfoundland (Island on the east coast of Canada) ... hence the draw of the St. Lawrence River. This cottage was originally built and owned by Mario's grandfather. We jumped at the chance to have it back in the family when it came up for sale. It is next to Mario's parents so a great location for visiting the grandparents! For a small family like ours, this was the perfect place! It is a beautiful cottage (the owners obviously take great care of it), and it had everything we needed. The place is also conveniently located (it takes about a half hour to get to old Quebec, whether you drive in or go to the ferry—we did it both ways). Our 8-year-old son loved exploring the beach each day and finding “treasures” (sea glass, interesting sea life bones, etc.)! Our son declared as we drove away, “This is the BEST place and the BEST vacation I’ve ever had!” Our only regret was that our stay had to be shorter than a week this year, but we hope to return for a longer time next year. This cottage was perfect for our first trip to Quebec City with our kids, ages 9 and 10. It is not far from amenities, but once you arrive and the end of the private drive, you feel miles away. The setting is so quiet and peaceful. The views are even better in person - you can sit at the outdoor table and watch the ships pass by. It is about a 30 minute drive to the Levis ferry which transports you quickly and very affordably to Quebec City. We had such a wonderful time exploring the area. The owners were very easy to reach and very accommodating. Highly recommend this one! Everything you want in a get away lovely cozy and only a short drive to old Quebec city. IT WAS JUST WHAT WE WERE LOOKING FOR. QUIET, COZY, PEACEFUL. BEAUTIFUL VIEWS. WOULD DEFINITELY STAY AGAIN IF THE OPORTUNITY PRESENTED ITSELF. The cottage is located on the top of beautiful steep coast and has fantastic view on St. Lawrence River. The location is in ~30 min from historical Quebec City. The cottage is clean and supported in good condition. However, it is very small and is probably fine for two people, but is too cramped for 4 people. Bathroom and kitchen are perfectly renovated. Kitchen has new large electric stove and large refrigerator, however doesn't have microwave that doesn't require large space, but could be convenient to quickly heat some meals. Despite bed sheets and blankets were laid, towels were not provided. Finally, the sleeping area in the attic is very cramped, and because of this it is stuffy when 4 people sleep, even when both windows are open. Thus, despite our general impression is more positive than negative, the charge 201 USD per one night seems overpriced.